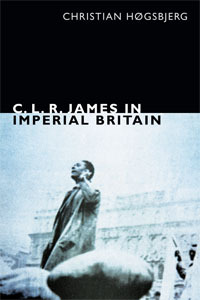 I am grateful to Christian Hogsbjerg for giving me a copy of his account of CLR James’ emergence as a writer in the conditions of 1930s Britain (Duke UP, £16.03). It is a compelling book, of the right length for its material (280 pages), which sheds significant light on three aspects of James’ development, first his debt to revolutionary Nelson, second the impact of cricket on his Marxism, third, his (re)discovery of Toussaint L’Ouverture. Hogsbjerg revisits James’ appointment as Neville Cardus’ deputy on the cricket page of the Manchester Guardian. He places the 1933 West Indies’ cricket tour of England – James’ first major assignment – within the immediate context of the preceding ‘Bodyline’ Ashes and a hypocritical scare that the Windies might now attempt leg theory against England. He follows James’ rejection of Donald Bradman – not a builder of social movement but a mere accumulator of runs. And he digs out a later piece in which James attempted to explain bodyline in terms of the ides to be found in Spengler’s Decline of the West (another book loaned by Cartmell): “it was the violence and ferocity of our age expressing itself in cricket”. From the perspective of a socialist activist living in Weimar Germany, Spengler might have been a bitter reactionary; but for someone who had been educated in the British colonies, the idea that the direct rule of the French and British empires was doomed to an imminent end had a different, more optimistic meaning. James rediscovered Toussaint, Hogsbjerg argues, in 1934, after moving to London, in a period where he was surrounded by both Trotskyist and Pan-Africanist friends, and was attempting a complex merger of these two strands of left-wing politics. Hogsbjerg detects other socialist influences on James’ Black Jacobins, including the French historiography of 1789, Marx, Jaures, and Kropotkin. James had a vision for the immediate future in colonial Africa, predicting what Hogsbjerg characterises as “a fluid and confused situation … with some whites immediately fighting in the ranks alongside black Africans”, in a single process of “international permanent revolution”. I enjoyed the book, and recommend it to anyone who cares about James’ life and intellectual development. It is pleasing to find that even after three decades of James scholarship there are still new things to be said about one of the most inspiring and iconoclastic of the Trotskyists. Good to see that your entirely justified praise for Christian’s work has not been in any qualified by recent disagreements. Maybe it is right to assert that what unites us is more important than what divides us – even though those divisions also have their importance. And hi to Kent from many many years ago. Christian’s biography of CLR in the thirties, and Ian’s biography of Tony Cliff, are two of the best books to come out of the IS diaspora in quite some time. Are there comparable works that I’m forgetting about? Hi back, of course. I agree about the value of Satnam Virdee’s book – there are plenty of excellent recent books from those who have remained in the SWP as well – for example Anne Alexander(and Mostafa Bassiouny)’s recent work on workers and the Egyptian Revolution, John Newsinger on the British Empire and more recently on the American working class, Donny Gluckstein on the Paris Commune and more recently WWII, John Rose on the myths of Zionism… Alex Callinicos’s book on Imperialism and Global Political Economy was also impressive (I have not attempted to decipher Deciphering Capital yet…). Definitely Neil Davidson, and most definitely China Mieville. (I’m especially fond of ‘The City and the City’.) Hadn’t heard of Sparrow or Virdee before. Gluckstein? Rose? Callinicos? Perhaps, but would need to be convinced. A list of ten or so plausible titles from the past decade or so might make for an interesting lives;running blog post. Thanks Dave for taking the time to write this, and to Kent and Ian for their kind words. In the spirit of Marx, and his point that ‘to leave error unrefuted is to encourage intellectual immorality’, I would just make a very minor clarification to what Dave has written. I do not use the phrase ‘revolutionary Nelson’, and James never claimed that he learnt his revolutionary politics in Nelson. Nelson was called Little Moscow not so much because many of its residents looked towards the Russian Revolution (it only had a tiny little local branch of the CPGB) but primarily because of its tradition of municipal socialism coming out of the strength of the Independent Labour Party locally which for example had an excellent programme of house building. The strength of religious nonconformity and Independent Methodism was far greater in Nelson than the appeal of Marxism – and as EP Thompson pointed out, Methodism is not particularly revolutionary. What James said he learnt in Nelson was a socialist politics that was not abstractly rooted in books but lived through working class solidarity in organisations like the Nelson Weavers Association which went on strike while James was resident there in the autumn of 1932. James saw during this mass strike in this English town a glimpse of the tradition of socialism from below rooted in working class self-activity which challenged his more Fabian vision of parliamentary socialism which he had left colonial Trinidad with. Despite his reading of Trotsky’s History of the Russian Revolution and the French historians writings about the French Revolution in Nelson, he did not become an organised revolutionary himself however until 1934, and then he learnt his Marxism and revolutionary politics in the tiny Trotskyist movement.